This week my cooking has basically been all about necessity. I needed to get the CSA veggies out of buckets and off of my kitchen floor. So instead of showing you boring pictures of spinach, pak choy, bok choy, and radishes freezer ready, I thought I would share a recipe that I have mentioned a time or two - Fruit Tea Bread. This bread is more like their kind of tea bread. If you are having a Christmas tea and are looking for authentic recipes, take it from someone who has sampled A LOT of English tea room delicacies, this is pretty darn close. This is a great recipe that I found while visiting Miz Helen's Country Cottage. I have adapted it slightly. The original recipe is here. 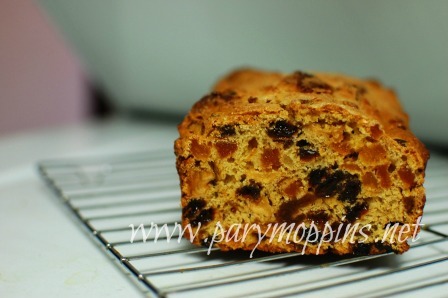 Make you some tea bread, have yourself a cuppa and relax. Make 2 cups of Earl Grey tea, one for you and one for the recipe. While you are sipping your tea, grease your loaf pan. Pour 1c. of the tea over the fruit in a heat proof bowl, cover the bowl with a tea towel, and let stand for 30 minutes. Beat together the egg, 1/3c. sugar, and fruit. Sift the flour into the fruit mixture and mix well. Pour the mixture into the loaf pan and tap on the counter top to evenly distribute the batter. Sprinkle the remaining sugar over the batter. Bake at 350F for 50 minutes. Take it out and let it sit on a wire rack for 10 minutes before you slice it. We justify having it for breakfast since it has all of that fruit in it and is relatively low in sugar. This adapted recipe is back at Miz Helen's. I just love what you did with the recipe and I can't wait to try it. I am honored that you would us my recipe. My very best wishes to you and your family for a blessed Thanksgiving. Thanks for sharing with Full Plate Thursday and hope to see you again real soon! And a happy Thanksgiving to you as well Miz Helen!